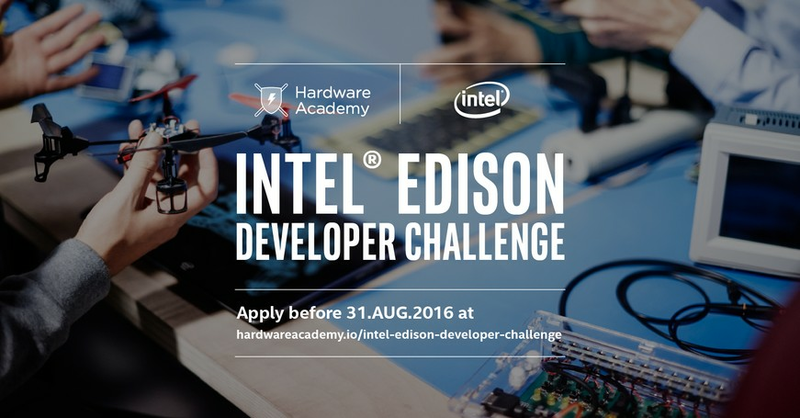 London, UK - 26th July 2016: Intel teams up with Hardware Academy to launch the Edison Developer Challenge for IoT developers. - The 10 best product proposals will receive a free Edison kit and will have 8 weeks to build their prototype. - Are you a developer or engineer with an idea for an IoT product? Then this is the challenge for you. - £1,000 cash prize and 3D printing coupon worth £500 for the winning prototype. London based Hardware Academy, has announced its recent collaboration with Intel to hold the exclusive Intel Edison Developer Challenge, an online competition for IoT developers to bring their ideas to life. Hardware Academy has teamed up with Intel to look for exciting new IoT projects that are developed and built on Intel technology. The Intel Edison Developer Challenge is looking for IoT developers to submit product proposals with a view to building a new working IoT prototype. The projects are expected to combine the Intel Edison, sensors, gateway, cloud technology and imagination. The prototype solution should aim to solve a problem associated with managing in the home or office, or an IoT gateway to manage a refrigerated vehicle or factory, or any other scenario where applicants step up to the challenge. As well as giving developers the chance to work on provided Intel Edison hardware, the winning prototype will be awarded a cash prize of £1000 and £500 worth of 3D printing services (offered by 3D Hubs), and gain valuable exposure on the Intel developer zone. Hardware Academy was founded in 2015 by David Bellisario and Fabiano Bellisario with the aim of helping IoT developers sharpen their knowledge to build disruptive IoT products. Hardware Academy brings together like-minded individuals giving them the chance to get hands on with some of the industry's leading technology. Through participating in workshops, seminars and classes, attendees have the privilege of receiving the best technical support directly from the companies developing the technology. Since its launch last December Hardware Academy ( www.hardwareacademy.io/ ) has partnered with leading technology providers in the IoT sector to provide professional training to the new generation of IoT developers. The training sessions not only introduce developers to some of the major IoT developer platform such as Intel Edison, Samsung Artik or Nordic nRF52 SoC but also to IoT cloud management platforms such as Microsoft Azure IoT. With the likes of Intel, Samsung, Microsoft and Nordic Semiconductor taking part, Hardware Academy has already inspired and educated hundreds of IoT enthusiasts who range from beginners to expert engineers and CTO’s of established technology companies. “In the ever growing and fast paced hardware industry staying current with the latest technologies can be challenging. Learning new development tools can be a huge setback for anyone trying to update their skills or bring their ideas to life. Hardware Academy fills that gap giving developers the chance to get hands on with the latest development tools in the IoT sector whilst receiving the best technical support directly from the companies who create the technology”.